Pastures are like laundry—they’re never “done” and need to be kept up with. 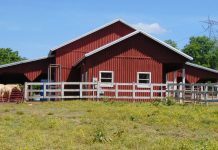 What may be intact in the spring may need repair by fall, so regular inspections should be part of your barn chores. 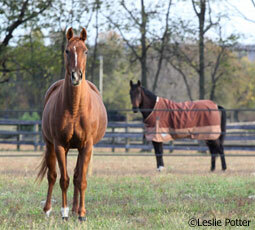 And, even though your pasture may appear safe, it can harbor many hazards. Remember, if there’s one out there, your horse will find it. This is THE biggest safety concern. Never leave a gate unlatched thinking you’ll shut it later, or you’ll “be right back.” No horse is safe if he manages to get out of his pasture. If the gate is open, or is closed but not secured, your horse will gravitate toward it like iron to a magnet. Always double check. 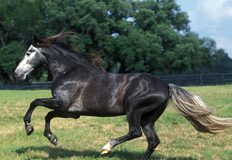 If you keep halters on your horses when they are turned out, be sure they are leather or “breakaways.” You can buy them either ready made from a retailer, or make your own by cutting the halter’s buckle strap, boring a hole in the nylon which you cauterize with a match, and threading leather shoelaces through it and tying a tight knot. Leaning posts or posts that have broken off at the base. Hot wire that has shorted out until it breaks. Also look for newly exposed, previously buried electric wire under gates. Weeds entangling lower electric fence rail (thus lowering or eliminating voltage). Fencing that can’t be easily seen, such as white electrical tape on snow, black or brown tape at night (tie on flag tape for better visibility). Any downed fence or weak endposts. Hazardous objects that work their way up to the ground surface such as nails, glass or sharp-edged metal. Protruding objects—nails that work their way out of posts, broken tree limbs, et cetera. Toxic weeds or leaves that blow into the pasture. Louann Chaudier lives on a small farm in Wisconsin with her husbanc, three horses, two goats and six cats. Previous articleWhat’s In Natural Grooming Products? was found injured a few mornings ago. At first, we thought she may have been shot (after all, it is hunting season), but a pasture investigation revealed that she had (in the middle of the night) fallen on an old engine! It was jutting out of the ground – heavy and dangerous, with sharp, rusty metal parts sticking up. Although the mare will be okay, I’ll be checking my pasture weekly now! Thanks again for the great article. That’s a good checklist… I’ll have to print this out. Good checklist. Going over this every day while you’re going about buisness reduces risks greatly! This is a wonderful site and informed me a lot. Cood checklist for your horses safety. It’s sad when a small bit of carelessness can end up hurting a horse. If I see a strange leaf in the pasture, I throw it in the trash immediately. 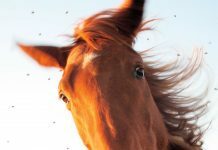 It’s better to be safe than sorry, and your horses’ health should always come first. Excellent advise. I put my horses in my friends pasture while mine was flooded, and my TB came back with cuts and slices all over his legs from branches that were piled up in the middle of the pasture for a burn. We didn’t expect him to go play in the pile of branches 5 feet tall, but he did and now he’s a mess! I posted at my barn on the dry erase board: “Do not cut corners because it takes too much time!” Been there, done that! I like the idea of make your own breakaway halter. I have old halters and leather strings I can use. Great points. However I regularly leave my gates open and come right back. If the horses are eating they have absolutely no interest in going out. It’s also much easier to let them go from one paddock to another without having to do the work myself.